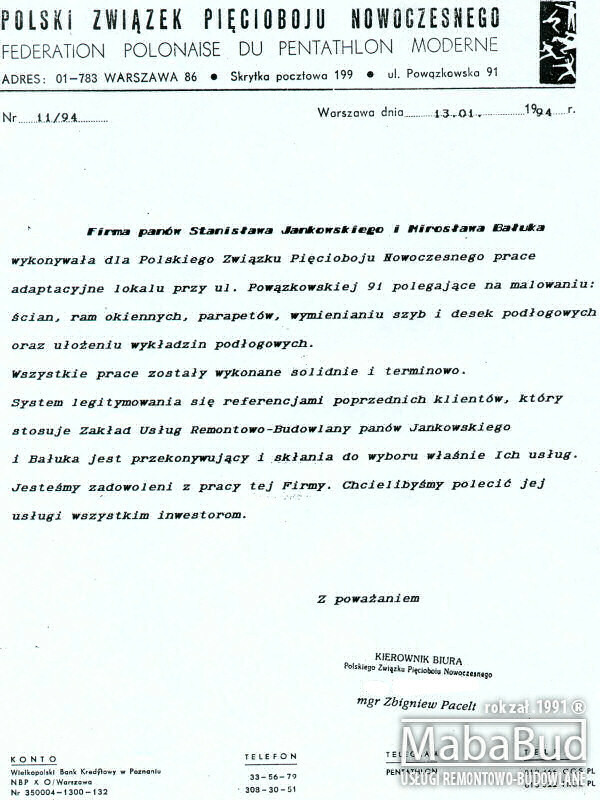 Cooperation with Mr. Mirek was very calm, without the need for special surveillance, and work has been done at the highest level. Here also is to be commended for Mirek's employees, whom depends on a very good performance of their work. 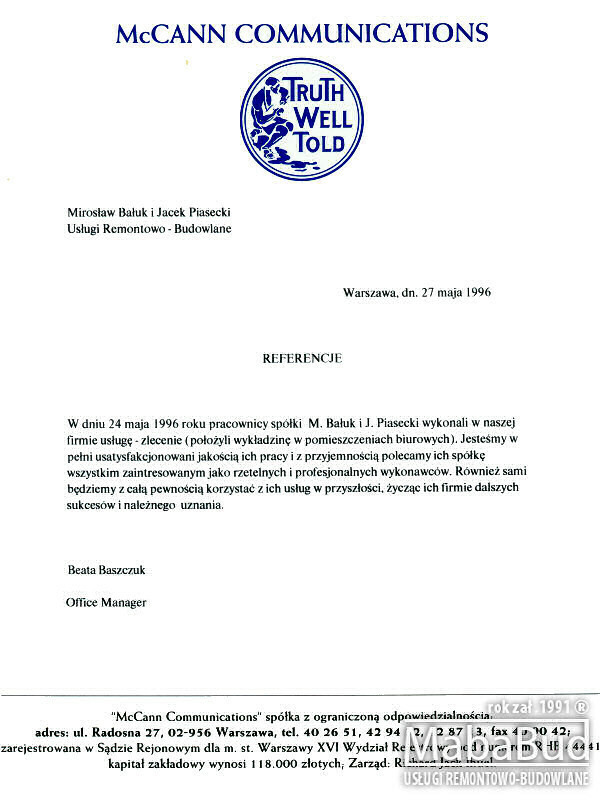 I want to truly inform all concerned that, in my opinion, the Miroslaw Baluk's Company belongs to companies with the highest grade of professionalism. The services of the company, I use for years. 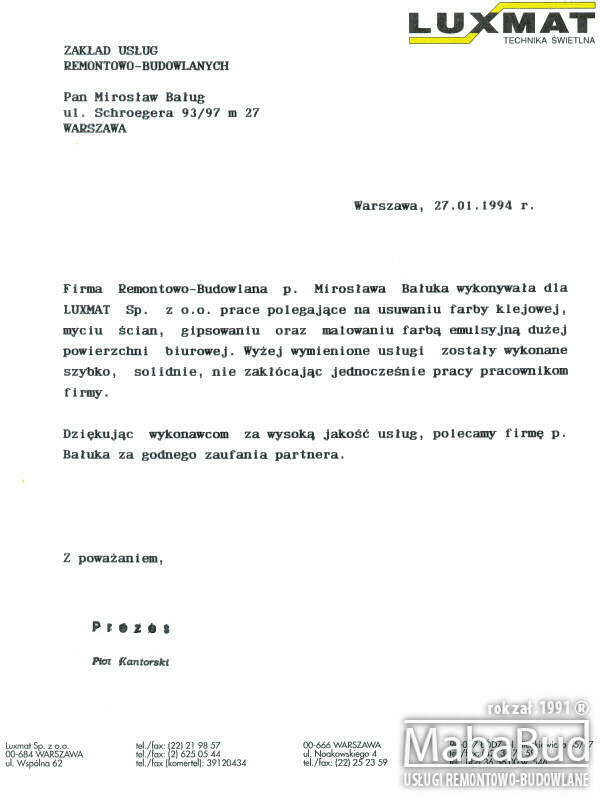 At that time, Mr. Miroslaw and his team conducted three comprehensive renovation of housing and in the future I will also certainly use his services. 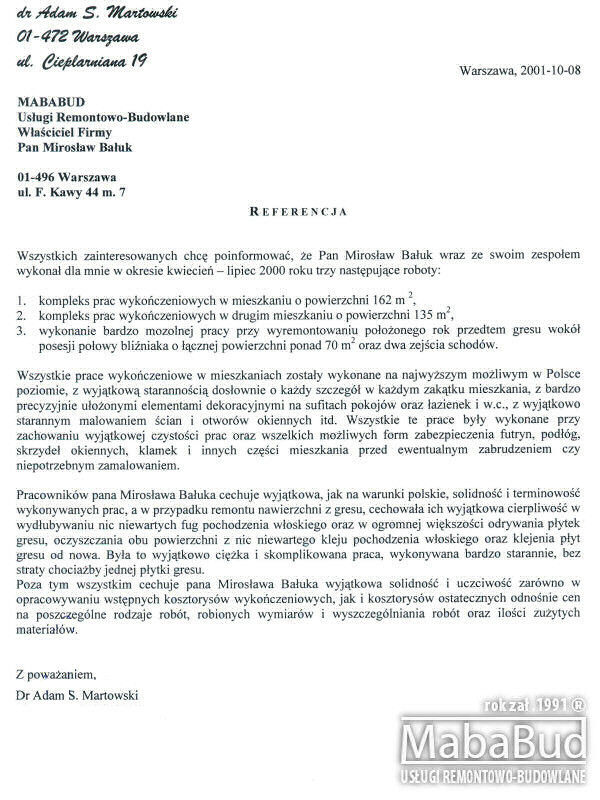 With full responsibility, I recommend Mr. Miroslaw's Company. All finishing works in homes were made at the highest possible level in Poland, with extreme care in virtually every detail in every corner of the apartment, very precisely aligned with the decorative elements on the ceilings of the rooms and bathroom and toilet, with extremely careful painting the walls and window openings, etc. All these works were done while maintaining the exceptional purity of the work and all possible forms of protection frames, floors, sash windows, door handles and other parts of the apartment before any dirt or unnecessary inpaint. Besides all this, Mr. Miroslaw Baluk features outstanding reliability and integrity in both developing and finishing the preliminary estimates and final estimates on prices for individual types of works-made dimensions, and listing the works and the quantity of waste materials. With great pleasure I can recommend Mr. Miroslaw Baluk, who along with his colleagues who has worked for me, adaptation and finishing in two apartments with a total area of approximately 200 m2. Everything went quietly and without the need for special supervision, and was executed with exemplary direct care. 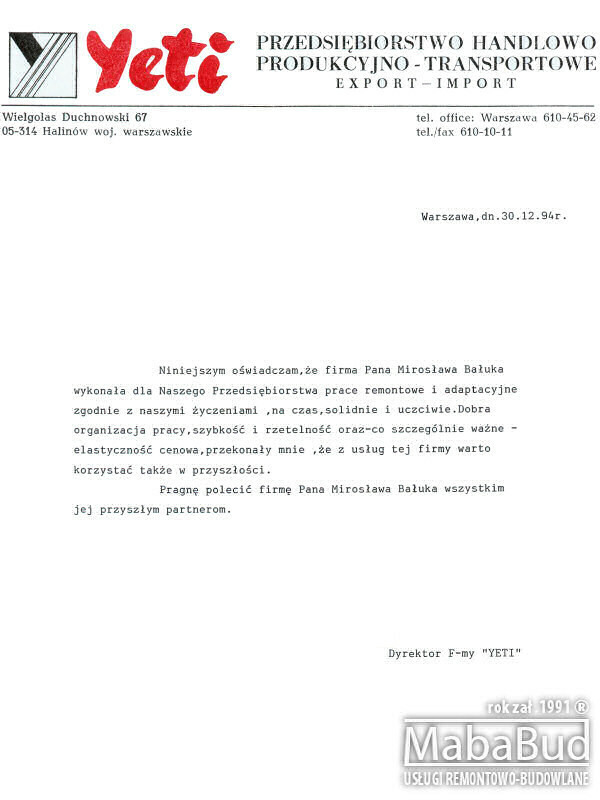 Is also worth stressing that at the time of our cooperation is not never happened to me at the agreed time limit to wait in vain for Mr Baluk which - as is known - is a phenomenon of our numerous repeat of the labor market. 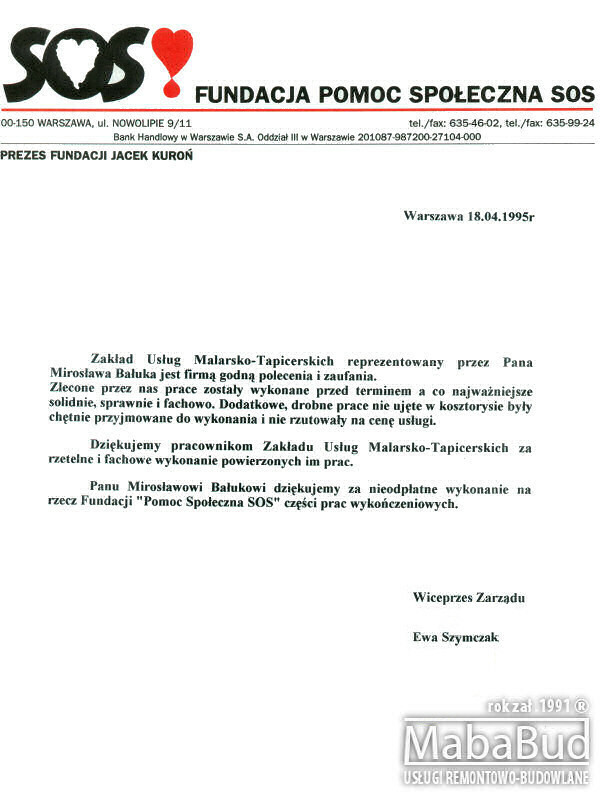 On 24 May 1996 employees of the Mr. Baluk's and Mr. J.Piasecki's company, has done service for our company - the order (put carpeting in offices). We are fully satisfied with the quality of their work and happy to recommend their company to all interested as reliable and professional contractors. We will also certainly use their services in the future, and wished them further success and the company due recognition. 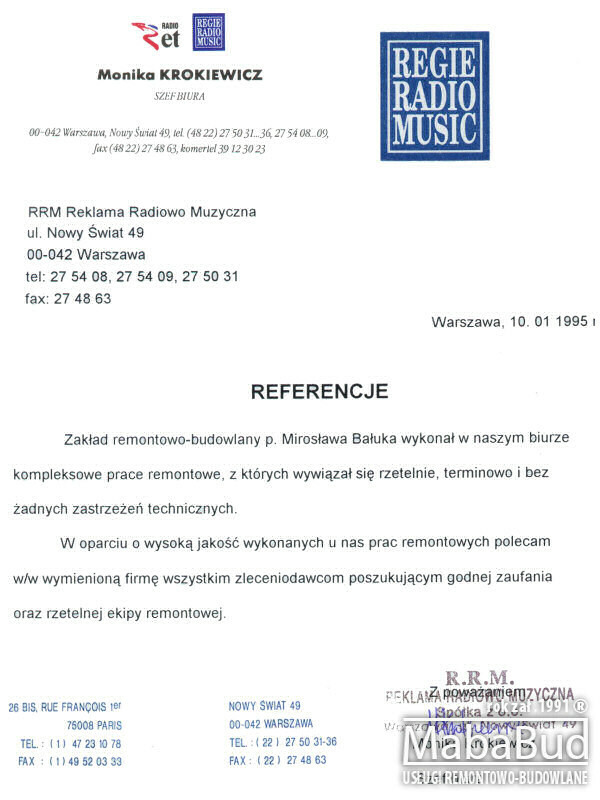 Mr. Miroslaw Baluk's company has done repairs works - building on the premises of our office at Kasprzak 25A street and in the shop at the House of Euro Commercial "Sesame" in October 1995r. Provided services characterized by a high level of professionalism, integrity, and no way they disrupted the functioning of our institutions. Painting and-upholstery industrial services represented by Mr. Miroslaw Baluk is a company worthy of command and confidence. Commissioned by the work we have done before the deadline and most importantly, securely, efficiently and professionally. Additional minor works not included in the quotation was taken to comply willingly and not influenced by the price of the service. Thank workers for reliable and professional execution of their work. 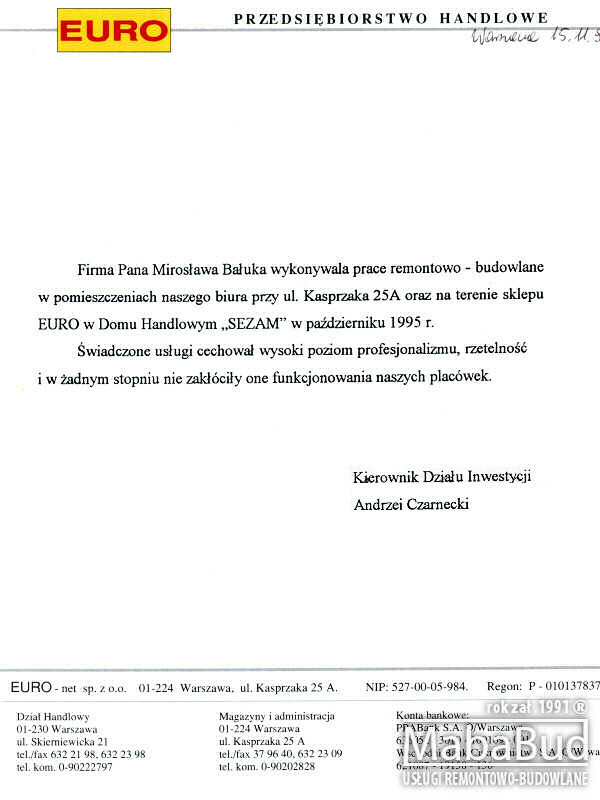 Thank Mr. Miroslaw Bałuk you for a free finishing work for the foundation "SOS Social Assistance". 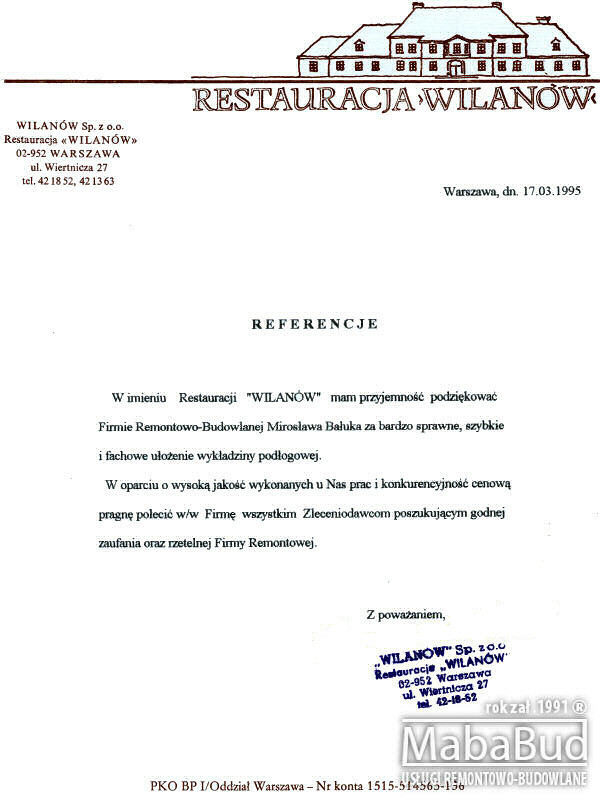 On behalf of Restoration "WILANÓW" I am pleased to thank the company for very efficient, fast and professional arrangement of floor covering. Based on the high quality of work done for us I would recommend the price competitiveness of the aforementioned company all outsourcers seeking a trustworthy and reliable Repair Company. Mr. Miroslaw Baluk's repairing-building departmen, maked in our office complex renovation work which fulfilled accurately, on time and without any technical objections. On the basis of high quality of repairs works made for us, I recommend Mr. Miroslaw Baluk's company for all companies seeking a trustworthy and reliable repair crews. 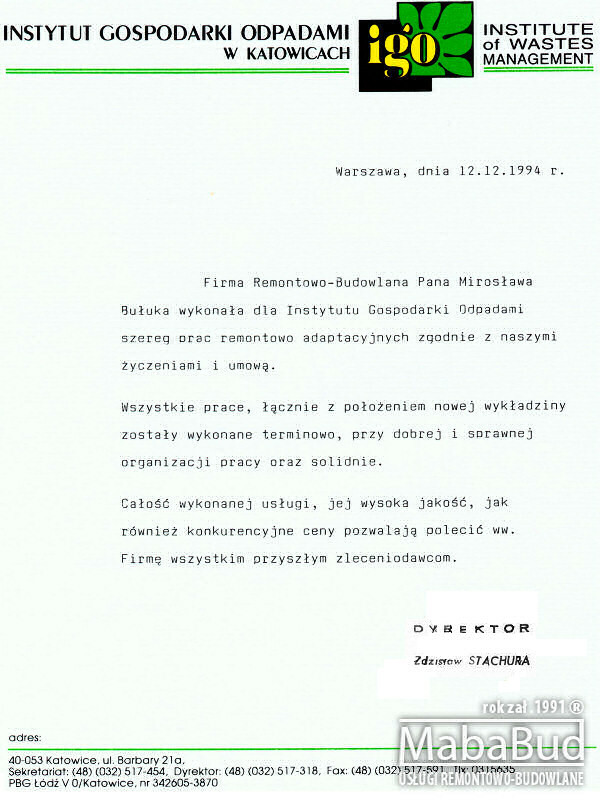 I hereby declare that the Mr. Miroslaw Baluk' company done for our company under renovation and adaptation in accordance with our wishes, at the time, firmly and fairly. Good organization of work, speed and reliability, and - most importantly price elasticity, have convinced me that the services of the company's worth using in the future. 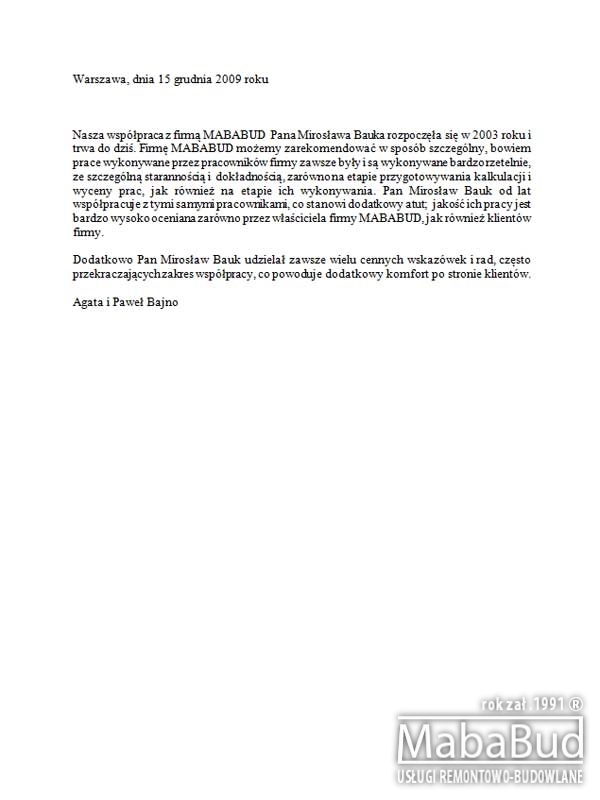 I would like to recommend Miroslaw Baluk's company, all its future partners. 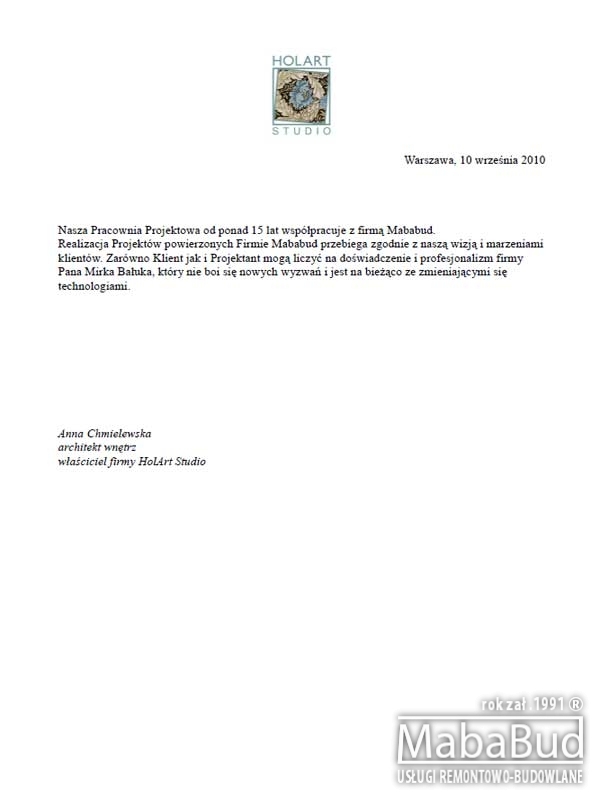 Miroslaw Baluk's Renovation - Building Company done for the Institute of Waste Management of renovation and adaptive range in accordance with our wishes and the agreement. All work, including the location of the new carpets were made in a timely manner, with good and efficient organization of work and firmly. Overall the service, its high quality, competitive price as well as allow the company to recommend all prospective financers. 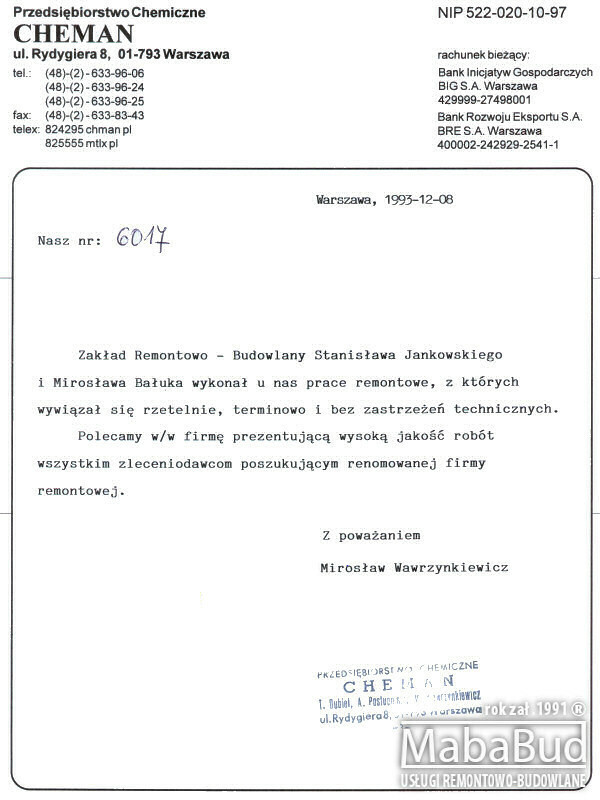 Hereby certify that Miroslaw Baluk's Renovation - Building Company made for Agencies and Services Sp. 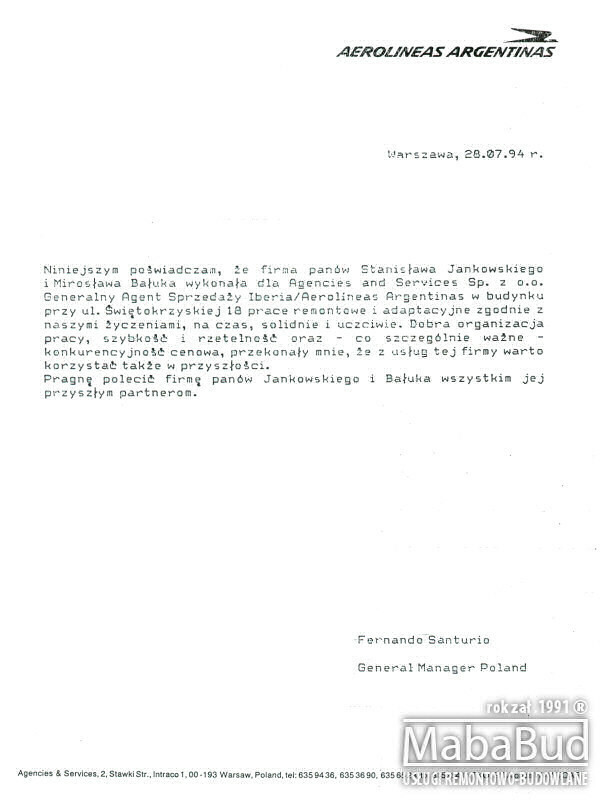 z oo General Sales Agent Iberia / Aerolineas Argentinas in the building at Swietokrzyska 18 street repair work and adaptation in accordance with our wishes, at the time, firmly and fairly. Good organization of work, speed and reliability, and - most importantly competitive pricing, have convinced me that the services of the company's worth using in the future. I would like to recommend the company all its future partners. 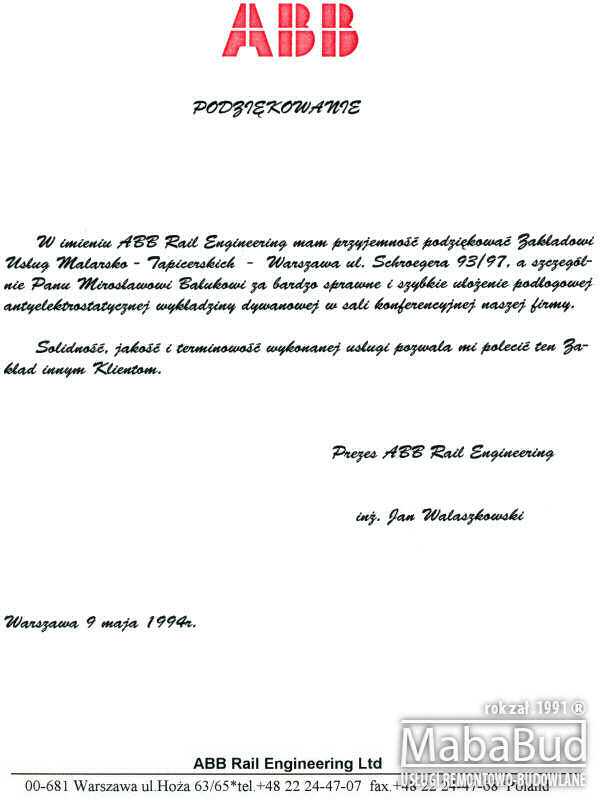 On behalf of ABB Rail Engineering, I am pleasure to thank the Factory Service Painting-upholstery - Warsaw, Schroeger 93/97 street, and particularly Mr Miroslaw Bałukowi for very smooth and quick laying of anti-static floor carpet in the conference room of our company. Reliability, quality and timeliness of the service allows me to recommend this company to other customers. Miroslaw Baluk's Renovation - Building Company made in our repair work, which fulfilled accurately, on time and without any technical objections. We Recommend the company presenting high quality work to all reputable companies seeking financers Repair. 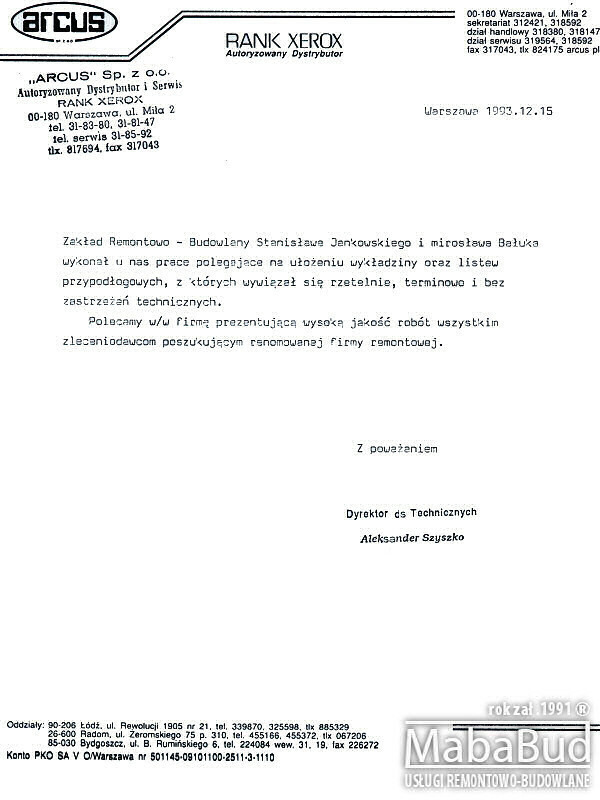 POLISH TV - POLSAT S.A.
Hereby certify that the business men and Miroslaw Stanislaw Jankowski Baluk made for Polish Television Satellite POLSAT SA in a building at Al. U.S. repair work and adaptation in accordance with our wishes, at the time, firmly and fairly. Good organization of work, speed and reliability, and - most importantly - price competitiveness and flexibility, have convinced me that the services of the company's worth using in the future. 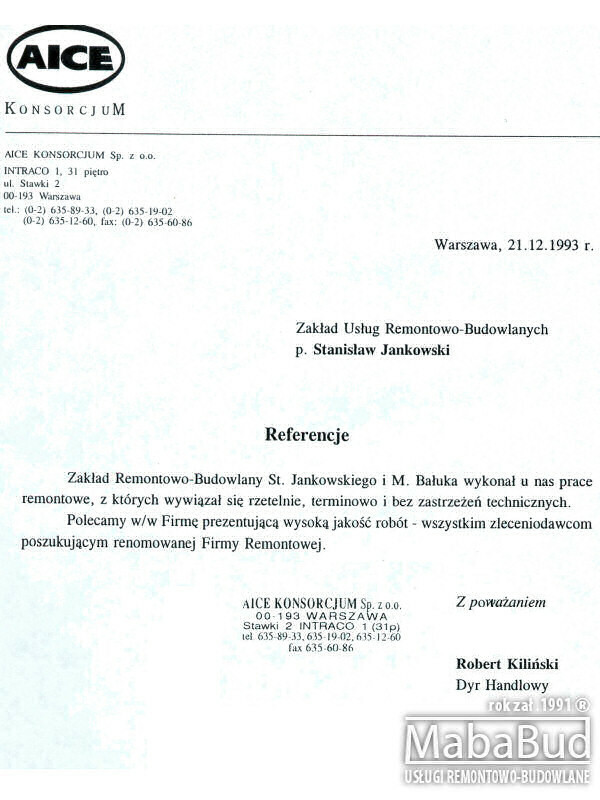 I would like to recommend the company and Mr Jankowski Baluk all its future partners. 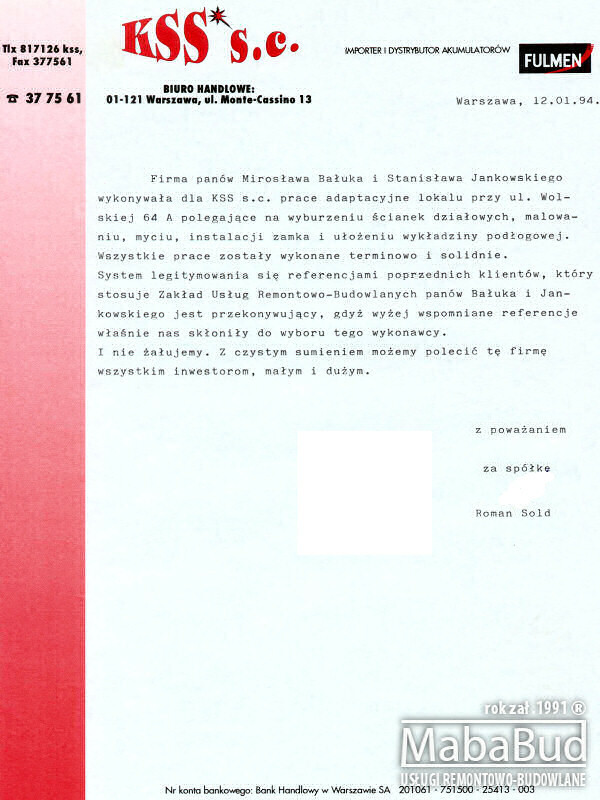 Miroslaw Baluk's Renovation - Building Company used to make for LUXMAT Sp. z oo work consisting of removal of paint glue, washing walls, gipsowaniu emulsion paint and painting a large office space. Above-mentioned services are carried out quickly, reliably, without disrupting the company's employees working at the same time. Thanks the workers for the high quality of service, the company Mr Baluk looks for a trustworthy partner. All work has been done reliably and on time. We are satisfied with the work of the company. We would recommend her services to all investors. All work has been done in a timely and soundly. With a clear conscience, we can recommend this company to all investors. Miroslaw Baluk's Renovation - Building Company has made for us repairs works, which fulfilled accurately, on time and without any technical objections. We Recommended the company presenting high quality work - all well-known companies seeking financers Repair. Miroslaw Baluk's Renovation - Building Company has done for us repairs works (painting, laying carpet) which has implemented fairly, without any technical objections, in a timely manner. I Recommended the company for all customers looking for a reputable repair company. Miroslaw Baluk's Renovation - Building Company ahs made for us work involving the arrangement of floor and skirting boards, which fulfilled accurately, on time and without any technical objections. We Recommended the company presenting high quality work for all contracting authorities seeking reputable refurbishing company. Miroslaw Baluk's Renovation - Building Company arrangement made lay carpet in our office. Work was done conscientiously, efficiently and quickly. Therefore, I can in good conscience recommend the services of this facility to other customers. 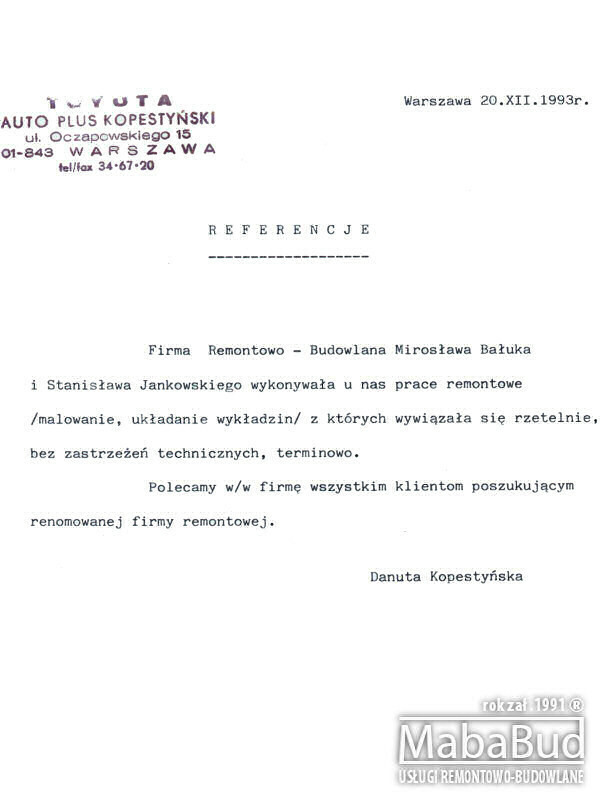 Stanislaw Jankowski's and Miroslaw Baluk's Renovation - Building Company made for us repair work, which fulfilled accurately, on time and without any technical objections. Recommended the company presenting high quality work for all contracting authorities seeking reputable refurbishing company.